Almost precisely a week ago I was tweeting away like a mad thing about how I had rambled into Monsoon on Grafton St to try on a coat I had spotted online on their website. I went in, tried it on, all good & even better again with a giant €60 off tag hanging off it – epic win thinks Steph. Until she looks at the original pricetag which reads €250. €250?! I must have been looking at a different coat as that’s out of my budget. To the iPhone (eventually) and to Monsoon.co.uk where I find the exact same coat priced at £120. Now I’m no financial whizz but I worked out that £120 couldn’t be close to €250. The kind Twitter followers who are not on a dodgy EDGE connection tell me that Monsoon do deliver to Ireland for a sum of £7.95. So I purchase said coat at it’s reduced price, popped home and did my sums and to my surprise and delight I discovered that purchasing the same coat online from the same retailer I could have it delivered for €150. That’s €100 less than the original price tag. So I ordered it and it arrived today – a week later – in perfect nick to my door saving me a nice few quid indeed. Now I’m not one to normally shop in Monsoon as it’s on the top end of my budget but maybe there’s something there – maybe I just can’t afford their exchange rate, not their garments! Seriously, €100 difference in price? Is this an extreme example of high street retailers taking the mickey? I’m going to do some more investigating while hitting the shops at the weekend for a few winter bits. I’ve never bought any other clothes online aside from Threadless tees but I think I’ll be a lot more thrifty and inclined to check online from now on. Last order date is December 20th for standard delivery, 21st for priority delivery both depending on the availability of items. 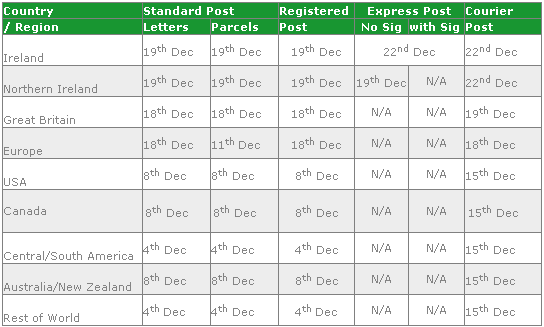 Last order date is December 19th, again depending on item stocks. Most big products (Mac, MacBook) need to be ordered by the 11th, smaller items (iPod etc) by the 20th. Full list is here.